The Rigol DS1104Z-S-Plus is a very high quality 4 channel digital storage oscilloscope with built-in 25 MHz bandwidth 2CH arbitrary waveform generator. 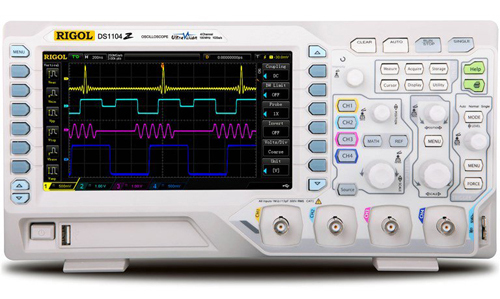 The scope features a real-time sample rate of up to 1 GSa/s and a bandwidth of 100 MHz. The Rigol oscilloscopes are equipped with well designed and easy to use controls offering comprehensive ease-of-use functions for all measuring tasks. The menu navigation is intuitive and available in several languages. This high performance standard not only ensures capturing real-time instantaneous signals, but also observes details of repeated signals. The DS1104Z-S-Plus has a refresh rate of up to 30.000 wfms/s, enabling users to capture instantaneous signals, as well as abnormal signals more quickly. It also helps to enhance the waveform capturing ability and to expedite a circuit debug course. The quality of the Rigol oscilloscopes is comparable to Agilent and Tektronix oscilloscopes. The particularly large TFT color displays are very easy to read. Thanks to an intelligent system for displaying or masking information, the largest possible area is always available for displaying signals. The signal curves, the FFT display, and other functions can be shown simultaneously on the display.